(Q) Which devices are compatible with Samsung Pay? (Q) What do I need to get started? (A) Compatible device, a Samsung account, registered fingerprint or Samsung Pay PIN, and the latest software update from Samsung installed on your device. (Q) Where can I use Samsung Pay? (A) You may now use your First Basin Credit or Debit card to make purchases from anywhere that accepts SamsungPay. It is now super easy and secure to pay in person or online all with the touch of a finger! Bam! (A) Yes! 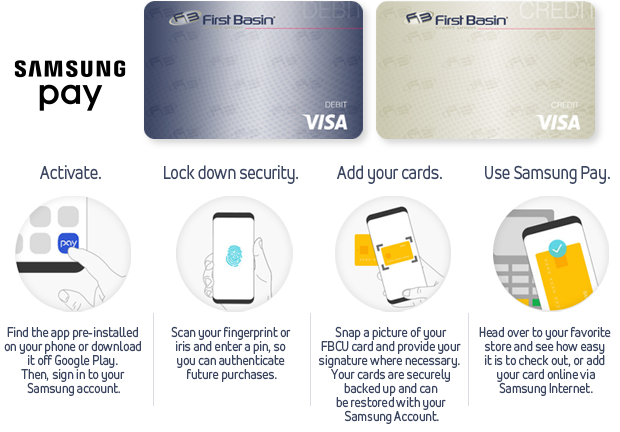 Your Samsung Pay transactions are authorized with your fingerprint, so you’re in control of when each payment is made. Each transaction uses a device specific number instead of your card number, which means your transactions remain secure, and your information stays safe. Plus, with Samsung Knox technology embedded, your device is constantly monitored for signs of malicious attacks or vulnerabilities. Even if your device is ever compromised, your card information is still safely encrypted within a separate and secure data vault. Not to mention, your purchases remain yours alone; Samsung Pay doesn’t store or share your payment information.